We see DORIAN asleep in a daze, lying on his oversized, comfortable bed, drink spilled on the corner of the bed, olive sitting perilously on the edge of the bed. DORIAN is covered with blankets and pie-crust edges stuck to plates. DORIAN stirs. DORIAN rolls over and goes back to sleep. We pan off DORIAN and sweep around his room. His room has a nice, very large television, a small home theatre system (the type someone would use if they had tons of money and a very good home theatre system in their actual TV room – this is just a backup. Perhaps the old one that he replaced. ), posters from various obscure bands. The only art that comes in the category of “fine” is framed original art from various underground cartoonists, in the vein of Tony Millionaire, Jhonen Vasquez or Daniel Clowes. In the doorway, we see DORIAN’S MAID trying valiantly to clean things off, including precariously picking the pie encrusted plates off the sleeping DORIAN. Soon, a beep comes from the kitchen, calling her off screen. We sweep back down onto DORIAN, the same shot we left on, and DORIAN slowly wakes up. DORIAN looks at the clock. It’s an expensive analog clock. He studies it curiously, realizes he’s too tired and hungover to figure out what the lines pointing to curious letters like “III” – that’s not even a word! – mean and sends his hand out, carefully past the analog clock, bumping it over in the process, and presses the button on the cheap talking clock, from a Harriet Carter-esque catalog, which informs him that the time is now twelve-thirty. Hmm. Twelve-thirty. Hmm. Lots of things to do at twelve-thirty. Maybe something’s on TV. Lots of things are on at twelve-thirty. DORIAN grabs the remote and turns on the TV. He flips through the channels. With that, DORIAN stands up and walks to his wardrobe. On the way, he claps, which causes the stereo to turn on, which blares the music of Takako Minekawa. He even sings along a bit, loudly and off key. Once dressed for the day, he ambles out the door. He neglects to turn off the music. DORIAN’S MAID makes sure that DORIAN is out of earshot of the house-of-music, then turns the stereo off. She then goes on about her business, cleaning things and whatnot. DORIAN pulls up in his car. He gets out and stands under the same window where the day before he taunted the homeless. He looks up at the second floor window, noticing that it, as always, isn’t open. TOM! TOM! COME OUT TOM! TOM can hear DORIAN shouting for him. Again, he sort of cringes and mentally prepares himself. TOM gets up. He ducks his head into his BOSS’ office. Uh, I’m going to take my lunch now. Is that OK? Thanks. Yeah. It’s a bit late, isn’t it? It’s one fifteen. Yeah, I know. (pause) I didn’t eat earlier. (pause) Some days I just eat late. BOSS goes back to working. TOM is relieved that he wasn’t caught in his lie. BOSS is relieved that TOM didn’t pick up that the BOSS doesn’t care, or rather, he would be, if, well, he cared. TOM comes down the stairs leading to the glass door, and out same. DORIAN is standing there still shouting for TOM, until he sees him out of the corner of his eye, shouts once more for good measure, then stops and smiles at TOM. Hey, Tom! Want to do something? This is my second lunch hour. No, it’s not. I could have been fired, Dore. When someone pays someone else to work, they don’t like it if those people they’re paying to work don’t actually work, Dore. It’s one of those concrete facts. You should be my assistant. What exactly would I do? You don’t really need a whole lot of assistance. At least not the sort I’d provide. I don’t know, stuff. I’d pay you. Like, more than you’re getting here, even. It’d be awesome! You should do that! What about in six months? You’re going to die, remember? The whole cancer thing? Oh yeah! You can be my medical assistant! Yeah, OK, but there’s two major problems with that. First off, you’re not getting any treatment. Second, I don’t know thing one about medicine. (pause) No, no it’s not. What would I do when you die, Dorian? I can’t live off of nothing. This job is pretty good, Dore, I don’t really want to lose it. Hmm, I can see that, y’know, getting two lunches is pretty sweet. No. Dorian, look, I can’t just leave this job for six months, so we can do stuff. It most likely wouldn’t be there for me when you kick off. Well, what about your inheritance? Well, fine. (changes the subject) Do you want to do something now? I don’t know. Somethin’. We should go somewhere. Stop wasting my time, Dore. Hey, hey, hey, I’m the one dying here. I should probably get some, y’know, special treatment. I’m not going to be here forever, y’know. I’ve got six months to live, and a lot of that’s going to be in incredible pain, you know. Immense pain. I thought it was your childhood dream. Hey, just cause it is doesn’t mean I don’t want to do stuff while it’s going on. Fine, I’ll tell my boss the lunch I ate just now isn’t setting well with me, and that I’ve got to go home sick and lay down. OK, cool! I’ll wait down here. We see TOM and DORIAN in DORIAN’S CAR, DORIAN driving. His car is a nice, fancy convertible with the top down. TOM and DORIAN must shout to be heard, but at least the radio isn’t on, which would make communication impossible. So, Dore, uh, have you made any (pause) arrangements? Well, I’m in the process of making them. I’m preparing something. It’s sort of confidential. What are you talking about? You’re not making a whole lot of sense here. I’ve got a plan, but I can’t talk about it at this point in time. (pauses) Because (pause) it wouldn’t be prudent to reveal the true nature of my plan at this juncture. Can’t you give even a hint? All will be revealed in time. But until then, no. (pauses) Does it involve suicide? Are you going to kill yourself? It is not best to speak of it at this time. (pause) Pull over, I’m going to drive. No, man, it’s my car! Look, I don’t care if you die, I just don’t want you to take me with you. No, no, it’s nothing like that. It’s a future thing. Very far in the future. I’m still working on it. Oh, so it’s a future thing. Like, what you’re going to invest in cryogenics? Are we going to get to saw off your head? …hmm, sort of. In a way. But not really. ’Cause it sounds to me that you’re just making it up as you go along. No, I’ve got a plan. I’ve got it all planned out. It’s just a matter of squaring things away. It’s no big deal. Promise? You’ve got a plan, you’re not just lying to me to make me think you’re preparing, when in reality, eventually you’re just going to pass out on the street and have them drag you into a pothole? No, man, I swear. Look, I’m going to reveal everything tonight at the party, OK? Trust me. Just trust me on this one, OK? Again, another party, but this one, people aren’t mingling. DORIAN’S standing in the middle of the room, and all his guests are sitting around him in a half circle. No music’s playing this time, but everyone’s got liquor. In the center, we see TOM, JILLIAN, NAOMI and another man sitting on the couch directly in front of DORIAN. DORIAN’S giving a speech. OK, OK, OK, like, you all know that I’ve got cancer, OK, and you all know that I’m not doing anything about it. Well, actually, I am doing something about it. That’s what I’m wanting to talk to you about. Like, now. Uh, yeah. I mean, I’m not getting any treatments or anything, but I’ve made preparations, well, OK, I’m WORKING on preparations. But, y’know, I’ve got a plan. And it’s going to work out, OK? I don’t know, it might be a little difficult at first, but man, I’ve got six months, right? So, y’know, hey, I think I can get this to work. I’m not real good at this speeching thing here. Uh, I guess I should tell you my actual plan, huh? Shut up, man. Anyway, OK, OK, here’s my plan, OK. I want to be tinned. I want my corpse to be chopped up into little flakes and put into little tins of meat. Like tuna. Exactly like tuna. Even though I hate tuna. That’s my plan. I’m meeting with my lawyer tomorrow, and uh, we’re going to, uh, get this going. Hey, Bob! BOB, the lawyer and other person on the couch, uncharacteristically dressed when compared to the other partygoers, raises his hand and waves. He’s in his younger years of middle age. Enough experience to know the law cold, but also enough youthfulness to do crazy things as well. He dresses conservatively, but it’s just a cover for his actual, semi-subversive personality. So, uh, yeah. That’s it. I’m working on being tinned. Then you all can have a can. Of me. It’s sort of like cremation, only everyone gets the ashes, if you’re into that sort of thing. That’s the stupidest plan ever. Wait, Dorian, what? They’re going to.. put you in cans? Yep, they’re going to process my corpse, portion it out, and put it into cans with that watery stuff they put in the cans of tuna. I think it’s called “water”. I don’t know, I don’t eat tuna. But, yeah, that’s the plan. That’s what’s going to happen. This is another joke, isn’t it Dorian? This is just another stupid joke, isn’t it? You’re always pulling this sort of thing. You don’t have cancer, you’re not dying and you’re not going to be put into a bunch of stupid tins. Nope! 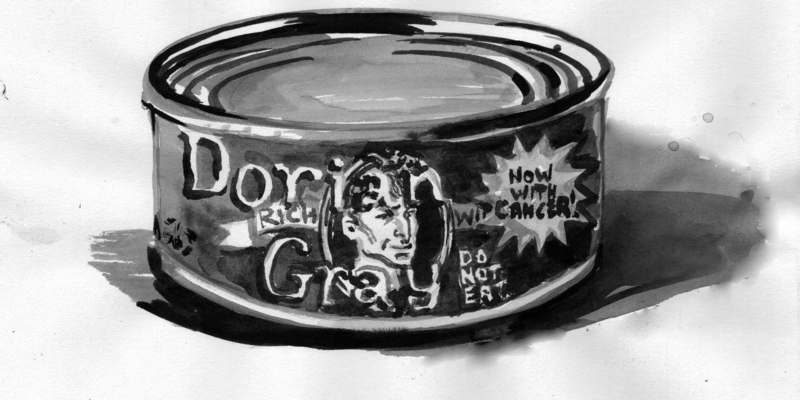 I do have cancer, I am dying, and I am going to be put into a bunch of stupid tins. I even hired Naomi’s design firm to work on the label! This is.. this is just beyond belief. You do realize this is probably horribly illegal and rather immoral, right? What happens if at the place where they (pause) they (pause) carry out your wishes, if when they go back to their standard operating procedure of tinning tuna if on the (pause) the machinery, there’s a bit of (pause, then whispered) you. On the machinery. Well, they’d wash everything down before and after. No contamination that way. I mean, I hate tuna, I don’t want my final resting place to have tuna. I hate the stuff. Ugh. All you think about is yourself! I can’t stand it! Here’s your stupid credit card! I’m leaving! JILLIAN stands up, reaches in her purse, grabs his credit card from the restaurant, and throws it at him, and runs outside. Bye! I’ll see you later! Thanks for coming! Hope you had a good time! Dore, I have to admit, this is pretty… odd. Even for you. But, hey, it’s business! And stupid. You can’t even think they’d let you do this. I mean, it’s so many layers of health risks on top of each other. I mean, it’s technically illegal to bury your cat in your lawn if it dies. I can’t help but think that even if some place wanted to, they’d have, well, pretty much any branch of the government that might even possibly care come down on both the plant and you in a matter of minutes after signing the contract. You can’t possibly find a company that will do this for you. And I don’t even think you’ve got enough money to buy your own tinning plant to have this done. I don’t know. I’ll check tomorrow, but I think you’re right. But, well, I know that I will make this work. It’s just a matter of waving enough money at them. This I know. This I know! Bob, you can’t possibly be in on this. Eh. Doesn’t bother me. I don’t like tuna either. Yeah, tuna’s pretty gross, Tom. This is insane. And stupid. Very, very stupid. Anyway, Tom, I want you to come with me tomorrow. To Bob’s office. To work on things getting squared away. I can’t, I’ve got work, remember? The place I keep telling you that I have to go everyday? Just call in sick. Say the second lunch you took made you sick. It already made you miss the rest of the afternoon. So, hey, maybe you’ve got salmonella or something, I don’t know. The Instagram Of Dorian Gray: Are you being upstaged by your online persona?